Reviews of my kids’ toys from me, a dad who’s a kid at heart! Sometimes as parents you just buy your kids toys because, well you want too. I believe that is the reason we bought our son the Mega Bloks First Builders Learning Train. In retrospect, I do not regret that decision at all. It really worked well for our son because he loves building with blocks, and making those blocks move just brought added enjoyment for him. There isn’t anything overly complicated about this toy, and I imagine most kids will enjoy playing with them. 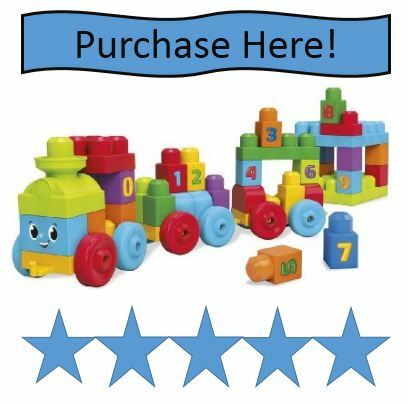 Here is our quick review of the Mega Bloks Train Set. This toy is recommended for children ages 1 to 5. 1 year olds might have a little difficulty putting the blocks together, but with a little practice they will be building in no time! This is a 50 piece set that comes with 3 rectangle pieces with wheels that act as the base of the train. Those pieces all connect together creating a 3 piece train! There are also 3 big square pieces that the manufacturer says can be used as train platforms. That is a nice thought, my son uses them more as platforms to build really high towers on. Stickers are also included in the set. There is two sets of 0-9 stickers which are placed on the smaller pieces. They help mark these blocks as part of the train set, but also can help teach your child to count. There are also engine pieces and smoke stack pieces so you can really make it look like a train. There are a few other decorative pieces that can be placed on the blocks. As a parent, the biggest draw to this toy is that it gives your child the ability to use their imagination and create a train that looks however they want. As long as the blocks aren’t stacked really high, the train moves pretty well. When moving fast, the three moving wheelbase pieces will disconnect, causing some frustration. My son has combined this train set with the other mega bloks he owns, so it is difficult to see where one set starts and the other ends. However, this also allows him to build bigger train sets, or use the train pieces to build huge towers! Overall, my son has really enjoyed this toy, and if you own other Mega Bloks, just expect this set to become incorporated with the others. Expect your Train Set to become incorporated with any other Mega Bloks you own! This is a really safe toy. The only difficulties you are going to face is your children throwing the blocks, and possibly slipping on the rectangle pieces that have the wheels. 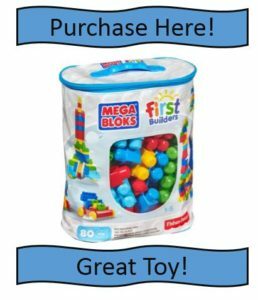 The blocks are also big enough that there shouldn’t be any choking hazards. Throwing toys is common for all toddlers, and these pieces are really light, limiting possible danger. As a parent, try not to throw the blocks at other people, let’s encourage positive uses of this toy. Slipping on the blocks or stepping on the blocks and hurting your foot is the other possible danger. This is more for adults. Your child can try and use the pieces with wheels as roller skates, but realistically, not much will happen here. They might fall down. As a parent you will have the inconvenience of stepping on these blocks from time to time. That won’t hurt too badly, and overall this is a super safe toy. It scores a 2 out of 10 on the danger scale, it is safe for pretty much anyone. There is almost nothing annoying about this toy. The only thing we hate as parents is stepping on these blocks in the middle of the night. Maybe someday we will be able to teach our kid’s to put there toys back when they are done. Otherwise this is a toy that kids can play with independently. It also helps encourage children to use their imagination. They can design their own train however they want, and they can use the pieces to build really impressive towers with other Mega Bloks. It scores a 1 out of 10 on our scale – I just can’t get annoyed at this one. My son really loved this toy, and now has just incorporated the 50 piece set into the rest of his Mega Bloks. He builds super big trains, and super big towers, and I can safely say I strongly encourage parents to purchase this toy. 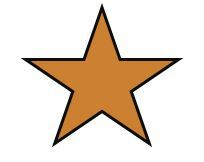 I do give it a bronze star rating, because the chances are it will become incorporated into other block sets you own. Our 30 Favorite Toddler Transportation Toys Reviewed! Toy Reviews by Dad, LLC (toyreviewsbydad.com) is a participant in the Amazon Services LLC Associates Program, an affiliate advertising program designed to provide a means for sites to earn advertising fees by advertising and linking to Amazon.com. All links to various products on Amazon.com should be assumed to be affiliate unless otherwise noted. See what we love to talk about! Copyright © 2019 Toy Reviews By Dad. All rights reserved.